Can my PC get a virus from my smartphone? - Ask Leo! Your computer is safe from any virus using the phone's operating system. But if you are using your smartphone as a USB device... that's another story. I wondered if a smartphone is infected with a virus. Is there a chance that the system (a PC or a laptop) could also get infected if a Windows-based malware/virus is present on the smartphone? Secondly, if a USB port is disabled in the system (PC or laptop), can there still be a virus attack on the system? There are two questions here. Let me address the first one. If you have smartphone-malware on your smartphone, it’s not going to impact Windows. Smartphones run a completely different, incompatible operating system than Windows, in the form of Android, iOS or others. Even if the malware could run, it would fail miserably. On the other hand, what does it mean to have Windows-based malware on a smartphone? Many smartphones can be connected to your PC and laptop. When they are, your smartphone appears as if it were a USB-connected disk drive. You may have been even treating your smartphone as if it were a thumb drive. If this is the case, then it might be a different story, particularly if you have an infected file or program. If Windows malware is on the smartphone, you plug it into your computer, and autorun is running, the Windows-based malware could start running and infect your machine. If you’re using your smartphone to carry software from one place to another, there’s nothing special about the smartphone that would inoculate you from malware. It’s still going to have the virus. In that sense, the smartphone can certainly still carry viruses. All of the usual caveats about staying safe as you use your computer apply in this case. Make sure you’re anti-malware tools are running and up to date. Turn off Autorun and Autoplay if they’re turned on. It’s pretty much exactly like having a USB thumb drive. Just look at it that way and you’ll see all of the same kinds of risks and rewards from having that kind of technology. As to your second question, if a USB port is disabled, it can’t be used to transmit anything back or forth, be it malware or good stuff. But it doesn’t inoculate your system. There are still other ways of getting malware onto your system, but disabling a port should prevent that port from being able to be used to transmit malware in either direction. Should My Anti-virus Scans Include My External Drives? - Malware can certainly insert itself on external drives. The question is how high is the risk? Can a Virus Spread Over a Local Network? - Windows Firewall will protect your machine from other computers that share the "safe side" of the router. « Previous post: How do I automatically forward Hotmail in Outlook.com? What if it is a Windows smart phone? That’s not a PC-compatible Windows, so the statements still apply. Hello Leo, I want to transfer my music, pictures, and videos to my Microsoft-Windows computer from my HTC VX One smartphone. However, the reason I’m doing that is because my phone is infected with a Trojan and some viruses. I want to transfer those things to my computer and reset my phone and yransfer my stuff back to my phone. If I use a USB cable, will my computer get infected? According to the article “If you have smartphone-malware on your smartphone, it’s not going to impact Windows.” So unless somehow Windows malware made it onto your phone, you should be safe. Good job Leo. How can i connect 5 harddisks 600 Gb to my computer system unit internally. 2nd, how can i slot 5 four Gb rams the same. I was charging my phone using the computer and now the computer will not work. It won’t even go to the desktop screen, it just says BOOTMGR is missing. Help! Is there a way to fix this!?! I transferred a couple folders that contained videos and photos from my phone to my pc via a data transfer cable. The very next time I used my computer, it went through the whole initial setup process and I had lost everything–as though it had formatted itself. Could this have been the result of a virus that was on my Android smartphone? My phone has also been having various problems like crashing, warning it is full when it is not, and rebooting at random. I have McAfee on both my computer and my smartphone, and I keep the definitions and program up to date. Also, if it is a virus, is there a way to track down the problem file? i connected my mobile phone to the pc for charging. Now the pc has be crushed. Now the it manager is sayin its because of the virus from the mobile. Is it true? Dose that happen? A mobile phone often appears as a USB thumbdrive when connected to a PC, and we all know that USB thumbdrives can indeed carry viruses. It is possible. If my nokia x2-01 mobi has virus in it …then can my laptop be get affected with it ..without connecting with usb..merely operating near by it ? Viruses which affect phones would not affect a PC. It is possible that somehow a file containing a PC virus might reside in a folder on a phone, but it wouldn’t be able to jump on to your computer from the phone unless you specifically copied it over via the network or bluetooth etc and then ran it on your computer. U mean laptop can’t be affected by a mobile with virus ,untill we doesnt conect it with pc or laptop …yes or no ? Yes. It would need to be connected, but connected could also be via WiFi, Bluetooth or the cloud etc. A laptop cannot be affected by a virus carried on your mobile unless the two are somehow connected. Connecting could be a cable, it could be WiFi, it could be BlueTooth, it could be via a shared app like Dropbox that copies files back and forth. In practice it’s HIGHLY unlikely. I probably have the android beca 3 virus on my android device. If i transfer some of my files to my windows 7 laptop, then to a new smartphone, is there any way to filter infected apk files? mr leo, i have a very strong virus laptop that if you connect a thumbdrive/pendrive it will effect once you connect the thumbdrive/pendrive to another pc/laptop , it will automatically shut down it self. 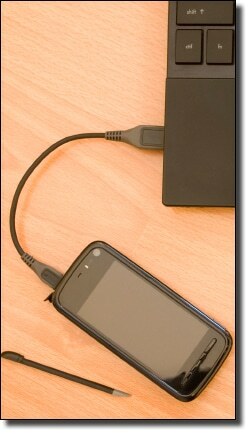 i want to connect my laptop with my iphone for itunes with usb cable. i want to know if i connect them both with usb cable, will it be affected? A PC virus shouldn’t affect an iPhone, but the virus should really be from the computer. It depends on the virus, what platform the virus targets, and what you actually do with the file on each platform. That depends on the nature of the virus. If it is targeted at Android OS, then it would affect your phone. If it’s a Windows virus, then it would affect your computer. Viruses are programs and can only run on the OS they are designed to run on. Although there might be a possibility of a cross platform virus, but that would be extremely rare if they exist at all. A few months ago, I went to a website on my LG Optimus smartphone using the google chrome browser app. When I clicked on the website’s link, a pop-up appeared saying: “Your Samsung Galaxy may contain a virus and download 360 security app to check for viruses.” I closed google chrome immediately and downloaded the Norton antivirus app from the google play store; I scanned my phone, and the app said my phone had no viruses. A few days later, I cleared the data from the google chrome app just to be on the safe side, and downloaded the 360 security app from the play store. I scanned my phone with this app, and it said my phone had no viruses, I downloaded another antivirus app from the store called lookout security and antivirus, and this app said my phone was virus free. A few weeks later, I transferred some music files from my phone to my computer by using my phone’s USB cord, and then a few days later, I transferred these files from my computer to my portable hard drive. I scan my computer each week with my Norton Security antivirus program, and it says that my computer has no threats and viruses. I will do a factory reset on my phone as soon as possible. Will doing this get rid of the virus? Does my phone, computer and hard drive all have a virus, or just my phone? Thank you very much in advance. Why do you think that you have a virus? That first error message seems like nothing more than a fake scare message trying to get you to download something. THAT something that you did not download might well be malware. Thank you very much for your help and for getting back to me promptly. I thought I had a virus because when the pop-up appeared, my phone made a vibrating noise. I realized weeks after, that there might not be a virus because of the word “may” in the pop-up, but I still was hesitant, and wanted to make sure. According to yours, and Mr. Jacobs’ comments, I am more confident now. “Your Samsung Galaxy may contain a virus” I think the keyword here is may. It sounds to me like a pop-up ad to scare you into getting their product, which as Leo said may be malware. Hello, I use usb to charge my android phone. looks like I got virus, some kind of file manager downloaded itself. I don’t have anti=virus except kingroot, but it kinda works also. It says that two apps:email service and keychain is serious threat to system security, so I deleted them. Newxt day i again charged my phone with computer… and again it has these two files. So theoretically it’s computer. Computer has 100% updated antivirus but it doesn’t detect anything. Please help! will this affect my pc if the phone contained a windows malware? And about troubleshooting tips,if i used safe mode+factory reset to my phone,would it remove any malware or virus there? Don’t know what you mean by “internal starge”. Bottom line: I would not trust it not to. Factory reset on your phone should erase everything including malware, yes. I meant MTP Device not usb device (no sd card attached) ,my phone is xperia and it appears like this,so in case of having windows virus and the autoplay is on can this virus sneak into my pc? That wouldn’t change the answer Leo wrote. Virus transfer is still a possibility. Hello, I have a question this doesn’t exactly apply to the topic but you sound very knowledgeable. So I have a Samsung vibrant and my photos were all deleted off of phone storage no sd card. So I’ve heard that they can be retrieved, I’m praying that’s the case. Could you tell me if I can get my photos back, if so could you let me know how? I would greatly appreciate it. Also the reason why this is partially related to article is because I’ve seen the downloads for retrieving deleted photos from phone. I was wondering if I download one of those apps for my pc and hook up my phone to my computer if the phone has massive viruses due to being hacked/tapped will it or could it transfer to my computer? I can’t download any type of virus protection on phone. Also could you tell me if any of those programs work? Your malware question is answered in the article you’re commenting on. As for whether you can get your photos back, the answer is a definite maybe. Some advertised software might work. My Samsung phone has a Virus, but I want to connect the phone to my Mac so I can Import files to my mac, before my phone dies (it’s and old phone). Because my phone is not a Apple owned phone, is it safe to connect my phone to my mac? And not get the virus. A phone virus wouldn’t be able to infect a computer as it has a different OS. If it happens to also have a computer virus on the storage chip, (a small probability, but still possible) it could affect your computer. I’d say the chances of that happening with a Mac are extremely low. No way to know. It really depends on the virus. It’s probably OK, but it’s also possible that it’s not. My laptop used to have virus, but then I just connect my smartphone(lenovo k3 note) to it(laptop) using phone usb to transfer some files. And now I just get my laptop fixed and my question is, is it safe if I’m doing the same thing like transferring some files from my smartphone to my laptop using usb without knowing if my phone has being affected by virus or not? I am just worry if my laptop will getting a virus again. Simply charging your phone shouldn’t cause the computer to get malware. What if my laptop has virus and i keep passing some of my music files on my phone. Does my phone will have virus too?? please reply. I’m super curious. Very unlikely, but not impossible. Bottom line: you have to assume anything (bad) is possible when talking about computers. I’m not sure how I got this virus, but I definitely have it. It has wiped out 3 hard drives on my HP and dell laptops, 11 USB drives, and even emptied a fixme stick. It seems to get stronger with each recovery option I try, and even writes itself onto repair discs. It has rooted my phone and even a factory reset doesn’t matter. I have a 2tb external HDD that still plays the movies stored on it, but now has new folders with files starting in S-1-5_________ followed by various numbers. If I plug it into a computer (even with auto play turned off), it infects. I can’t even see the device from the file folder page. It makes the sound of a device being plugged in, but no listing. The list goes on and on. Can I do anything outside of throwing everything away? Any anti virus or anti malware is worthless. I’d download and create a DBAN bootable medium. Plug in all the infected hard drives, boot from that and totally wipe the contents of all drives. DBAN aotomatically wipes the contents of all attached hard drives. I’ve heard that it doesn’t do a good job with flash drives and doesn’t work at all on SSDs. For those, I’d use a live Linux installation and format the flash drives. As for your phone, I’d try the support page of the phone manufacturer. I’ve blocked off regular USB drives on my Office network workstation using the Regedit tweak in USBSTOR. But then one day, I noticed that a Lab consultant had successfully transferred files to a PC that was USBSTOR locked….the consultant was using her PHONE as a transfer device. At once, I went thru all the other workstations where every staffer was essentially using the PC as a Charging Station for their phone and saw various Phones LISTED in the AutoPlay control. Now I am confident that except for the Lab Consultant, most no-one else even bothers to transfer files or anything. The USB connection is just a glorified Charging Port. Most average people don’t even HAVE plain USB thumbdrives anymore! But the continuing pervasive spread of Ransomware kept niggling at me. So I enabled the GPEDIT tweak to deny read write to MTP/WPD devices. But then the thought occurred to me…. Maybe we’re asking the WRONG QUESTION. Turn the question over. Don’t use the word VIRUS. Instead use the word MALWARE. The PHONE doesn’t have to be Infected. It just Needs to be a CARRIER. Millions of Phone users regularly download Freebie garbage apps that do pretty, amusing & useless stuff until they’re bored with the app and then forget about it. But they NEVER UNINSTALL it. Nevermind even bothering to look at what default Privileges the App has, including the functionality that keeps it alive and running in the background. In short– what if there was an APP that does NOTHING to the Phone, but it has one little module that does nothing but WAIT for the signal that the phone has just been connected to a Windows PC and recognized as a MTP device? And then, LIKE a Virus, it Injects its malware load across the link? If one computer or smart phone is plugged into another computer for charging, will the browser searches be transferred to the computer that is hosting the charge? Typically no. Technically it might be possible, but I’ve never heard of it happening. Can a smartphone get a virus from a PC via Bluetooth? Is it possible? Probably. I’ve not heard of a single case, though.